When it comes to innovation, Karen Khadijah Davis-Foulks is at the top of her game. 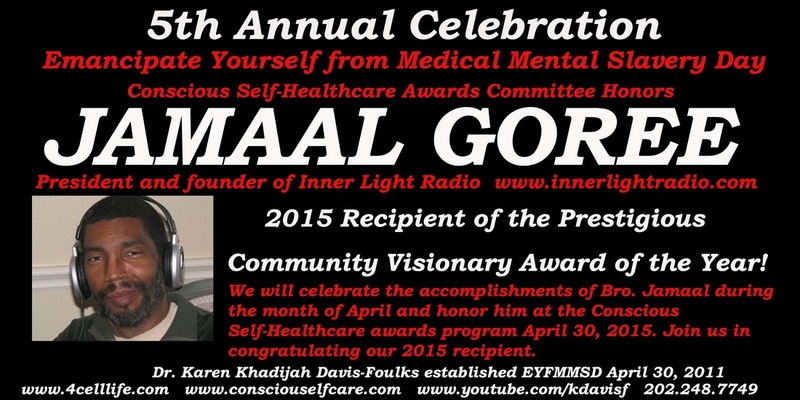 This year’s Emancipate Yourself from Medical Mental Slavery Day Conscious Self-Healthcare Awards Program will be recorded live on Internet Radio at www.innerlightradio.com on Thursday April 30, 2015 from 5:00 pm to 8:00 pm EST. The awards program, held yearly since 2011, will take on a new program format as it will not take place at a physical venue, but shared online with the international listening audience of Inner Light Radio and simultaneously broadcast live on other joining stations. The Awards program honors those who’ve shown their recognition, promotion and commitment towards the Self-Care Health Care and consciously taking responsibility for their state of health. “As more and more people begin to take better care of themselves by becoming more knowledgeable about their health and the wellness healthcare services offered, disease care will cease to exist. The Self-Care Revolution is happening now and more and more people are becoming aware of the damages of pharmaceutical drugs and the systemic challenges Big Pharma presents to Allopathic physicians to make a false diagnosis to earn more money,” says founder Karen Khadijah Davis-Foulks. “You may wait in a doctor’s office for two hours and the physician will have less than 15 minutes to spend with you for an accurate assessment of your health. This year’s recipient of the prestigious Community Visionary Award of the Year is Bro. Jamaal Goree, president and founder of Inner Light Radio. Goree is a former host of Talking Drum Community Forum on KJLH-FM and the owner of African Renaissance Productions. The recipient of the Dr. Nathaniel Caine Self-Healthcare Award of the Year is Karen Khadijah Davis-Foulks, founder of The Ark of Self-Healing and Self-H.E.L.P. (Health Education for Longevity & Peace) and host of Heart2Heart Healthy Living with Dr. K.
The recipient of the Shirley R. Hardy Senior Wellology Award of the Year is dedicated to the awards namesake, the mother of Karen Khadijah Davis-Foulks, Shirley R. Hardy. Foulks shares what she learned from her mother’s journey to emancipate from medical mental slavery over the past 9 years as a senior seeking wellness, her transition on August 25, 2014 and how she faced judgement from family members, friends, associates and others. The recipient of the Dr Winston Kokayi Kairi Patterson Pioneer Award of Year has not been named at this time. Support this year’s celebration and the Welfare 2 Wellness® workshops make a donation at www.paypal.me/4celllife/ enter your amount here. Heart2Heart Healthy Living Radio with Karen Khadijah Davis-Foulks airs Wednesday's from 4:00 p.m. – 5:00 pm EST on InnerlightRadio.com. Visit her Youtube channel www.youtube.com/kdavisf. Click the picture to hear the interview with Karen Khadijah Davis-Foulks and Ayo Handi-Kendi on why I founded this day and the 5th Annual Emancipate Yourself from Medical Mental Slavery Day Cell-a-bration. Listen to the panel guest as they share information to inspire you to take back control of your personal healthcare and connect with Dr. K . and Step Up to Quantum Health and Healing!! !